Givenchy is French fashion house. It was started by Hubert de Givenchy in 1952. The brand was well received from the very beginning and after such stars as Audrey Hepburn featured in the Breakfast at Tiffany's with the famous laconic dresses, the brand's name was already among the well established fashion houses. Givenchy menswear section has always been a bit conservative, except for recent years when Riccardo Tisci was named the lead designer for the menswear collection and he brought some fresh influences. 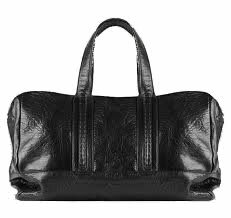 Givenchy men's bag line is offering dark and luxurious leathered large shoulder bags and hand bags. There are also smaller Givenchy men's messenger bags, beautiful and masculine looking gym bags and even black leather backpacks. The brand has made several masculine versions of the famous Nightingale bag, for example, the Nightingale carry all bag made for male clients and tote bag version as well. This bag was an incredible success in the women fashion handbag market and the brand is spinning its masculine version for men. There are also other man bags from the brand's accessories' line, for example the Givenchy carryall nylon and calfskin tote can be used as a laptop bag, men's shoulder bag or travel bag. Everything from this fashion house will be laconic and almost timeless. There is nothing about these designs that could become old fashioned - the pure lines and elegance invested in each purse will make them last. IF compared with other designer briefcases, for example, this is a bit pricey label to choose from, for instance, average price for a briefcase is around 1300 USD. But quality and design will exceed the expectation. 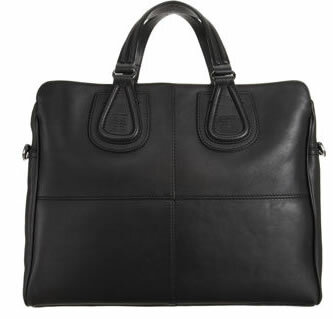 Let's look at the briefcase model available at Barney's right now (online store). This Givenchy laptop bag/briefcase (picture to the right) has it all you require: padded pocket for your laptop, great design, convenient pockets for carrying all necessary documents and things. It has a detachable shoulder strap and its size is 13" x 16.5" x 3". It is made in smooth leather. Price for this business laptop briefcase is 1,395.00 USD.